A creative and enjoyable craft is the decorating of cardboard boxes to use for home decor, storage, or gift giving. This is a guide about making decorative cardboard boxes. 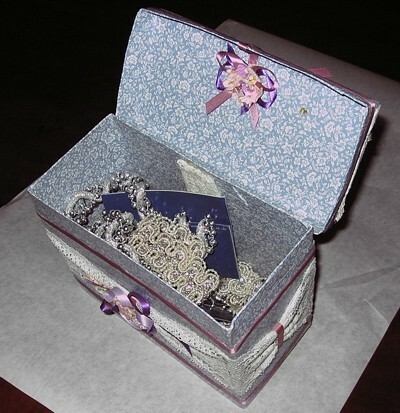 Recycle all types of boxes to make pretty storage boxes for your crafts, keepsakes, and precious memories. I cover my boxes on the inside just as nicely as I do on the outside. I so often end up giving them away, and want them to look like a "gift". 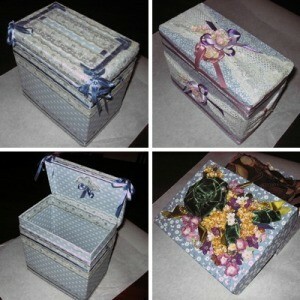 Choose your box and cover it with the material (paper, fabric, wall-covering, gift wrap) you like. If you've never done one before, don't worry. You'll soon get the hang of it. I had to do a couple before I learned the best ways of doing lots of things. Decorate it anyway you like. Be as lavish as you please. I use bits and pieces of old jewelry, tiny silk flowers, satin ribbon, whatever I like or things that mean something to us. Two of the ones shown in the pictures are "Memory Boxes" and were first covered, then the tops were trimmed using some fabric from a day-robe that my mom wore. It was her favorite, and we always teased her about wearing it all the time. I cut strips of it, folded them and made them into roses by gathering the fabric and using hot glue to fix them in place. The green velvet ribbon came from a dress she loved. Each of my daughters have their "Memory Boxes" already. 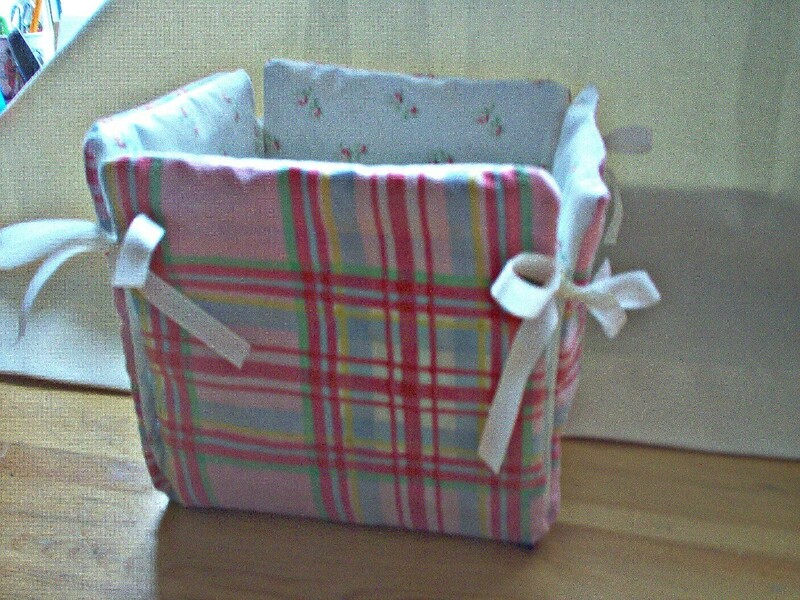 The two shown here that are full of handkerchiefs and scarves belong to my son and me. The two laundry detergent boxes with attached lids hold some of my "crafts in progress". I can leave them sitting anywhere, and they don't look so messy or out of place. Any questions, please feel free to ask, and I'll do my best to help. I need to make a decorated gift box. The box that the vase came in is kind of beat up and that was the last one. I was trying to think of how I could cover the existing box, as this is a gift. Can you cover it with contact paper? Use the broken box as a template to make a new one out of cardboard? Or just forgo the box entirely and use a gift bag? Good luck! At least it is just the box -and not the contents that are battered! Take it out of the box, put flowers in it, wrap a bow around it and..wah-la! So beautiful and fresh flowers at this time of year seem to be so much more special! Give it to the recipient as soon as you walk in the door! Or take it out of the box, wrap it in lots of tissue paper and use a gift bag. If the vase is narrow enough wrap it in bubble wrap and put it in a wine bottle bag. They have lots of beautiful ones in dollar stores, Family Dollar, places like that. Fill it with Christmas balls, colorful candies, fruit and top with with a big bow! It isn't unusual for my store to take items out of the box to wrap them. I use gift paper, paper bags and homemade tags and bows to give items a more personal touch and my customers love it. So whatever way you give it the person receiving the gift doesn't know that the box was ruined only you do. Can anyone send me ideas or pictures to decorate a rectangular box like a book? It has a hinged lid. Measure the height and combined length of three sides, not measuring the back side. Find a ribbon or cloth piece that looks like it could pass for the closed pages of a book. Measure this ribbon or material to fit around the three sides and glue in place. Measure the top (hinged lid), back side, and bottom of your box. Find material to fit that area that looks like a book cover and glue in place. Decorate further as desired. 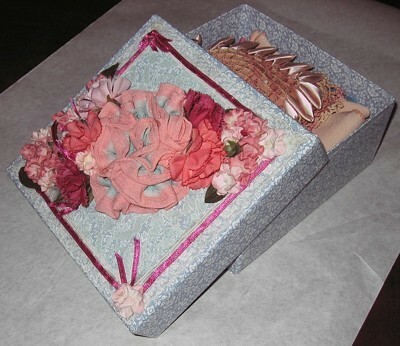 This box was made with a 4x4 inch paper mache box from the Dollar Store, some of my scrapbook papers, flowers, pearls, and a little vintage poodle figurine. Even the little pillow the dog is sitting on is made with paper.